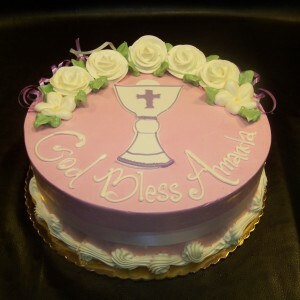 Featuring a plastic chalice applique, a crescent of buttercream flowers and vine design work. Includes customer’s choice of pastel color flowers and ribbon. Shown as a 10″ frosted in vanilla buttercream with shades of blue buttercream flowers. All flavors and sizes available with 7 day’s notice. Limited flavors available with 24 hour’s notice. Design Level B. 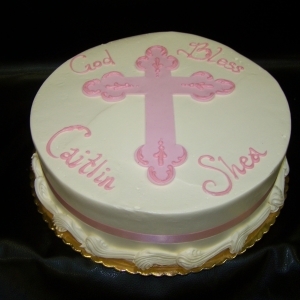 This design features a rolled chocolate cross in the center with hand-piped detail. Pricing includes customer’s choice of vanilla buttercream or chocolate buttercream. Shown as a 10″ round frosted in vanilla buttercream with a coordinating ribbon along the side. This design is available with a minimum of 7 day’s notice. Limited sizes & flavors available when ordering by Wednesday for the weekend. 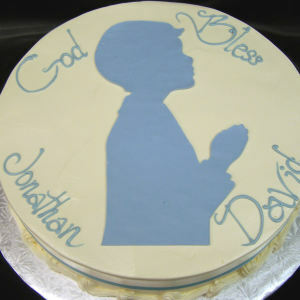 This design features a rolled chocolate silhouette of a praying boy. Shown as a 14″ round frosted in vanilla buttercream with a coordinating ribbon along the side. Pricing includes vanilla or chocolate buttercream. Also available in a girl silhouette. This design is available with a minimum of 7 day’s notice. Limited sizes & flavors available when ordering by Wednesday for the weekend. Cross cut-out cake with a top border of buttercream flowers. 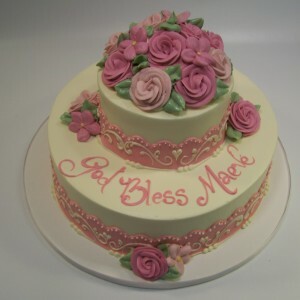 Includes customer’s choice of pastel buttercream flowers. 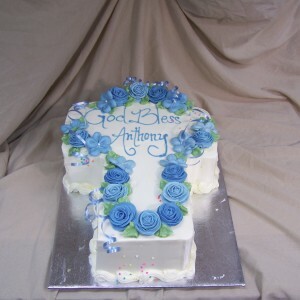 Shown as a half sheet cut-out frosted in vanilla buttercream with shades of blue buttercream flowers. 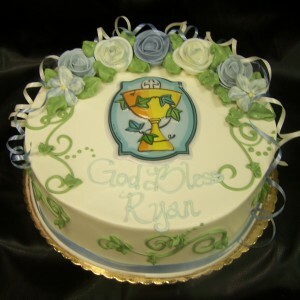 This design features a chalice made entirely out of rolled chocolate with a top crescent of buttercream flowers. Pricing includes customer’s choice of colored buttercream and pastel or white flowers. This design is available with a minimum of 7 day’s notice. Limited sizes & flavors available when ordering by Wednesday for the weekend. This design features a top bouquet of buttercream flowers and rolled chocolate bands finished with hand-piped design work. Pricing includes customer’s choice of (1) color rolled chocolate bands, white design work and pastel buttercream flowers. Shown with light pink rolled chocolate bands and shades of pink buttercream flowers. This design is available with a minimum of 7 day’s notice. Limited sizes & flavors available when ordering by Wednesday for the weekend. Cross cut-out cake with a top border of buttercream flowers. 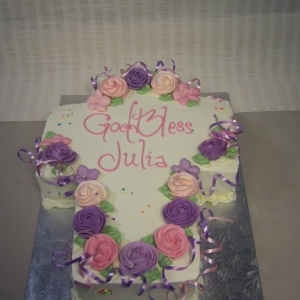 Includes customer’s choice of pastel buttercream flowers. Shown as a half sheet cut-out frosted in vanilla buttercream with shades of pink & lavender buttercream flowers. Available in two sizes with order placed no later than Wednesday for the same weekend.